Delivering this story is truly one of the classic "good news/bad news" situations we find ourselves in at times. Yesterday evening my friend Danny Stout, Dago Red owner Terry Bland's "right-hand man", called with news that I'll have to admit, I'd been expecting but dreading. TERRY BLAND WANTS DAGO RED TO BE RACED!! "Terry Bland has announced that DAGO RED and its support equipment is for sale. The sale will be made as a package deal only at a price of 1.5 million. All purchase inquires can be made by contacting Terry Bland @ 801-209-5633." Terry Bland, his crew and his able roster of pilots have responsibly and aggressively cared for and raced this historic RACEPLANE while it was in their charge. Over the past several years, they have brought much to the sport of air racing and they will be missed! 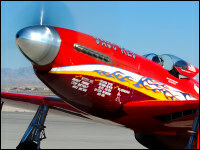 Standard thinking in the warbird community is that Mustangs and other warbirds are worth more as stock restorations than as racers The history of this particular North American P-51 Mustang airplane as a thoroughbred racer can not be ignored. Hopefully, whomever buys her will recognize this fact! Some airplanes have a longer and much more colorful history as a raceplane than they did as a military airplane and as such, should carry great value as historic racers. They may well have begun life as a military aircraft but they spent their careers as RACEPLANES. They were created as warriors and as raceplanes they carried out this duty and this is the way they should preserved. The travesty of Lefty Gardner's White Lightnin' being brought back to stock should never happen again and hopefully, Terry Bland's Red Steed will again grace the sky with a fully race prepared Rolls-Royce Merlin in her nose, fire in her belly and a racer in the cockpit!